In the age of seemingly unattainable wellness and constant connectivity, with people loading their schedule with 5am workouts, 12-16 hour workdays, healthy cooking, moderate coffee consumption, and a plethora of other high standards for performance, we are experiencing burnout rates higher than ever. Even more unfortunate, is the fact that women, who have fought so hard to achieve a competitive place in the workforce, seem to be the ones most affected, most commonly before the age of 30. Fast Company revealed in a 2016 article which, based on a study from the University of Kansas, which claims that “society puts certain expectations on people based on their gender from a very young age. Where women are more often expected to provide the majority of family care and raise children, men are expected to be the breadwinners and put work obligations before family. 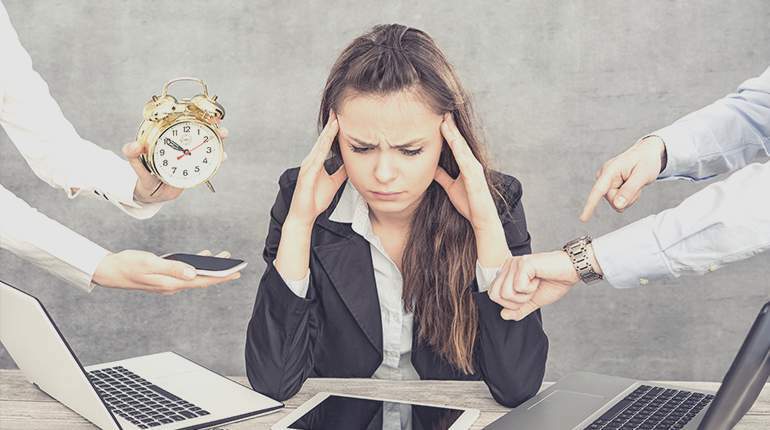 That was supported by the findings showing that women experience significantly higher rates of role overload, or feel that they are unable to complete their assigned duties in the work time allowed.” Beyond these expectations, Fast Co. also cited job dissatisfaction and a lack of clear trajectories as other contributing factors for early burnout. Severe Physical and Emotional Exhaustion — it may start as a lack of energy but this symptom can evolve into severe exhaustion, dread, and inability to cope. Insomnia — this symptom can also start as trouble falling asleep, and as you become more fatigued, your body persistently rejects sleep and it becomes a crippling nightly ordeal. Decreased Performance — when you are pulled in too many directions, and especially if you are not sleeping, forgetfulness is not far behind. By overcommitting and not taking care of your body and mind, you can get to a point where you can no longer accomplish anything and all your work is piling around you. You are less creative and find it hard to concentrate. Physical discomfort — sometimes the anxiety and exhaustion of burnout can manifest in physical conditions and symptoms like chest pain, heart palpitations, trouble breathing, gastrointestinal pain, dizziness, fainting and/or headaches. Illness — as we’ve discussed before, stress wreaks havoc on your immune system, and the weaker your immune system, the more vulnerable to infections, colds, flu, and other potentially sever medical issues. Alienation from Your Job — You find yourself taking on a negative or cynical attitude about work; you are increasingly frustrated. You may be rude to your co-workers. Depression — in the early stages of burnout you can feel mildly sad or hopeless, along with feelings of guilt and worthlessness. These feelings can evolve to extreme depression, suicidal thoughts and the sensation of feeling trapped. The above symptoms are just some of the most commonplace early effects of burnout, make sure to be mindful of yourself and your mental health as you navigate through your personal and professional life, taking steps to be kind to yourself and give yourself opportunities to de-stress. Here are some habits and tips that can help you improve your day-to-day stress relief, as well as feelings of balance and happiness. Steer clear of office politics — a study published in Health Care Management Review, found that those who didn’t let colleagues rudeness or office politics get under their skin were less affected by it. After following 596 Canadian nurses for one year, researchers found that those who ignored “workplace incivility” were less bothered by it and reported substantially lower rates of burnout. Breathe deeply — Sit up tall in your desk and focus your breath, counting every exhale from 1-10, when you get to 10, start over. Repeat 6 times. Don’t speak of the stress — It is so difficult, especially at the office, when you’re preparing yourself for a day of back-to-back meetings, skimming through the 100 unanswered emails in your mailbox, to resist the urge to talk about how stressed we are feeling. Unfortunately, due to something called the brain-body connection, a key principle in Ayurvedic teachings, this is a powerful act of self-sabotage. “Ayurveda teaches us stress is really our perception of, or reaction to, something” says Ayurvedic doctor Pratima Raichur. “It begins as a vibration in the level of the consciousness. Anything we repeat – which includes our belief patterns, our intentions, and our default languaging – is what we end up manifesting in our bodies and our lives”. If this sounds silly, think again. Biology backs up this belief – in the form of biochemicals called catecholamines. These are the fight or flight hormones, the ones that signal the brain about crisis, triggering the hypothalamus, which then activates the pituitary glands, that then alert the adrenal glands — which secrete hormones that provide us with the adrenaline rush symptomatic of stress. Adapt — Adaptogenics are having a spotlight moment right now in the wellness world, and for good reason. When you are firing on all cylinders all day, it’s important to help ease your mind and body before (or perhaps instead of) that glass of wine at the end of the day. Adaptogenic herbs are a unique group of ingredients that are used to improve the health of your adrenal system — the one that is responsible for managing all that stress you’re under. Ashwaghanda is a great place to start, most commonly associated with stress relief (specifically feelings of nervousness and exhaustion). Passionflower, in Flora Luna essence or capsule form, is great for helping to quiet mental chatter and overactivity. Go all natural — In general it is very therapeutic for living creatures to connect with nature, and that could not be more important when you are feeling overwhelmed at work. Unfortunately its not like we can all step out for a quick mid-day hike, but there are some little ways to feel connected even if you’re stuck at the office. Rosemary has long been associated with improving memory, so sipping on rosemary tea, or having some essential oil will definitely help calm those pre-presentation jitters. Having some plants as well as natural snacks at your desk can also help you feel a little more connected to the outside world. Me, me, me — On top of all the above recommendations, it is always important to take care of yourself: eat right, exercise, and get enough sleep. Also, make sure you carve out a little time everyday for yourself by breaking up the work day. It can be 5 minutes of meditation, stealing away for a workout during your lunch break, or just taking some time to be quiet and listen to your inner thoughts. The best way to ensure long and lasting success professionally and personally is to take care of yourself from the inside out. Put this time on the calendar and make it as much of a priority as any other meetings you schedule.